October 3, 2018 was a night to remember with a beautiful performance by orchestra and choir here at Greenway High School. 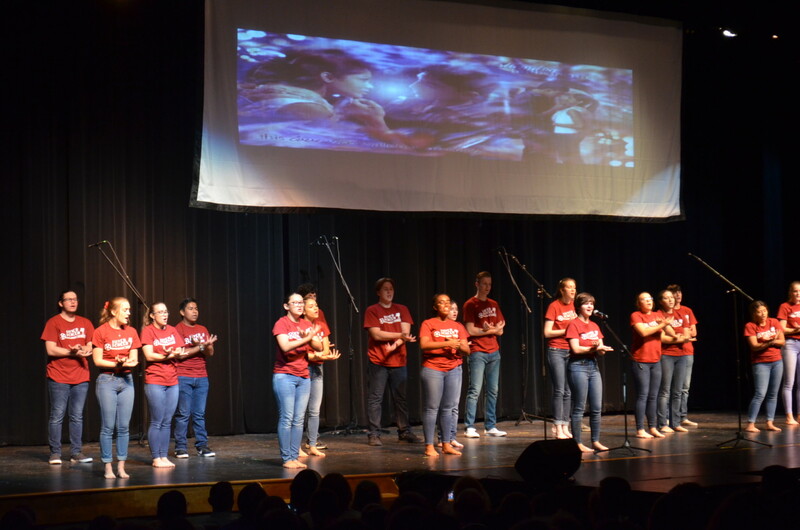 Directed by Mr. May, the night started off with the orchestra performing “Medley from Aladdin”, “I Dream A Dream”, and finishing strongly with “Pirates of the Carribean: Dead Man’s Chest”. The melodious sounds filled the auditorium as the spectators enjoyed the rhythm and notes. Then the choir portion began, directed by Mr. J.J. Rafferty, with all the choirs preforming “The Greatest Show” with a solo preformed by Parker Berkes. Concert choir preformed “Dancing Queen” from Mamma Mia, with choreography by Evangeline Sondergaard. They also performed “This is Me” from the Greatest Showman with a solo preformed by Maddie Wade, Rachel Fields, and Aly Spiller and choreography by Madison Wade and Kaitlyn Rendon. Their voices were well trained as if they were instruments that were played within their souls. Choir 3-4 preformed “Double Trouble” from Harry Potters and the Prisoner of Azkaban, and “Ghostbusters” from Ghostbusters. Choir 1&2 preformed “Dry Your Tears, Africa” from Amistad, and “Do- Re-Mi” from The Sound of Music with a solo preformed by Jenika Porbst. The songs from the popular movies made fans remember good times from past. Vocal Ensemble preformed “We Go Together” from Grease with choreography by Vicki DePastino and Sarah Walker. Then they preformed “Jai Ho” from Slumdog Millionaire, with a solo by Vicki DePastino. All choir girls preformed “Over the Rainbow” from the Wizard of Oz with violin from Anna Diamond . All choir boys performed “Men in Tights” from Robin Hood. For the final song all the choirs got on stage to preform “Seasons of Love” from Rent with solos by Lauren Smith & Bridget Mullings. The music was moving and the level of talent was high. This musical inspired concert was another great success. All of the performers and soloist did an amazing job expressing their talent for singing. All of the choirs did an fantastic job entertaining the crowd with their vocal skills and fun dance moves. My personal favorite song and a large crowd pleaser was “Men in Tights” preformed by all the boys choir. Their dancing and green tights was a fun surprise that made their performance the funniest. My personal favorite song from the orchestra portion of this performance was “Dead Man’s Chest”. They did an excellent job of preforming this song, and make you feel as if you were really in the movie. Overall we got another great chance to see the hard work and dedication that the talented members of Greenway’s performing arts presents.